As we celebrate a victory for the families who live and work near the Ellwood natural gas peaker plant in Goleta, the World Business Academy also sees this decision as an opportunity to advance the larger end goal of developing a renewable, community-based distributed energy system in Santa Barbara. The Academy applauds the unanimous decision by the California Public Utilities Commission (CPUC) to reject Southern California Edison’s proposal for a 30-year refurbishment of the 54-megawatt, natural-gas-fired peaker plant in Goleta. The CPUC on September 28th affirmed the Proposed Decision of Administrative Law Judge Regina M. DeAngelis, who rejected Edison’s proposal in order to “give the Commission additional time to explore whether any approved need in the Santa Barbara/Goleta area can be met in a manner more consistent with the Commission’s goals of reduced reliance of fossil fuel.” This sentiment was affirmed by comments from the Commission in their final ruling made last week. In court filings and at public meetings on this proceeding, the Academy asserted that refurbishing this aging plant would be disastrous during a transmission line failure as the plant would be forced to operate far beyond is permitted capacity, resulting in high particulate emissions and adversely impacting the surrounding neighborhood until transmission lines/towers could be repaired (a process that could take months, depending upon soil and weather conditions). Under these circumstances, it’s also very likely that during such an extended transmission outage, Edison would seek (and receive) a waiver on the plant’s emission restrictions given the extreme consequence of rolling blackouts in the area, resulting in local residents suffering from adverse health impacts due to excessive carbon and cancer-causing fine particulates emitted from the plant’s two gas-fired jet-engine turbines. 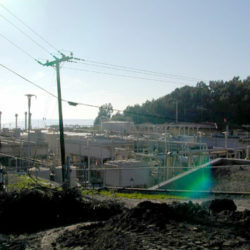 Refurbishing this plant, located 1,000 feet from Ellwood Elementary School as well as homes and businesses that have been built since the plant’s construction in 1974 when there was little adjacent development, would have stuck Goleta residents with a dirty, outdated facility for up to three more decades. With this decision behind us, NOW is the time for local citizens – and by extension the municipal and county governments that serve them – to demand a comprehensive strategy to develop safe, clean, local renewable energy. Technology currently exists to achieve this goal, and while a long-term solution might cost more than a short-term fix such as the Ellwood plant refurbishment, local renewable resources will deliver energy security, as well as environmental and economic benefits, each and every day for decades to come. We need vision and a strategy from local governments and supportive organizations. It’s a watershed moment, and we hope the region’s policy makers realize that, too.